"The immediate problem with our meat brains is that they have no back-up. We can lose the most precious information we have from one bump on the head or stroke. You want a mind system with back-up that can access other databases." Flying police car has VTOL. 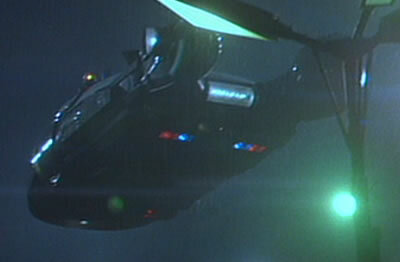 Obviously, the movie Blade Runner did not provide us with our first images of a flying car. However, it does provide one of the iconic views of the movie. From Blade Runner, by Ridley Scott. References to "aircars" have been found as early as 1871 (New York Times). "Aerocars" appeared in science fiction as early as 1929. The first working flying car was probably Waldo Waterman's 1937 Aerobile. It had a wingspan of 38 feet and a length of 20 feet 6 inches. A Studebaker engine provided power for flight as well as on-road driving. It could fly at 110 MPH and drive at 55 MPH. 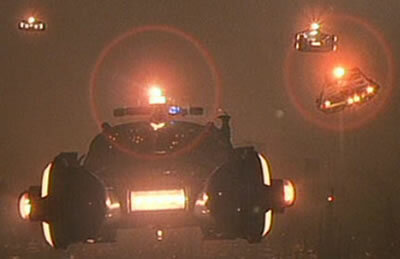 - X-Hawk Fancraft Like Blade Runner Flying Car?